Le Guin left us many great writings and some good speeches, too. My favorite of her books is her translation of Lao Tze. 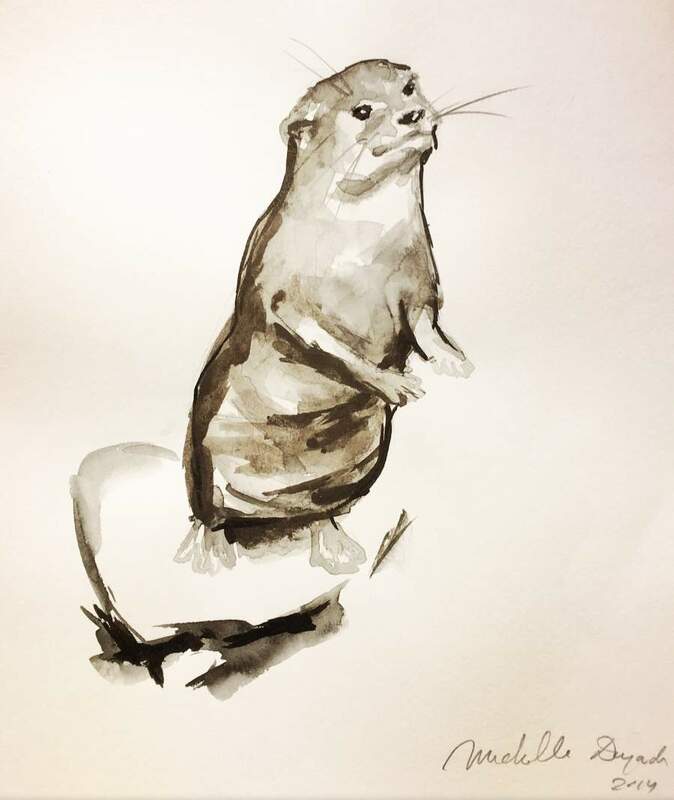 The otter is an original brush and ink work by Michelle Dujardin [etsy] I got it to illustrate a comment I was making about happiness and the tao, and now it hangs in my bathroom. The Left Hand of Darkness is my favourite of hers, and high on my list of best novels. And one of the few humans I admire. The Left Hand of Darkness and The Lathe of Heaven blew my mind as a teen-ager. In fact, I may pull < i> down, tonight, add some fireball to a mug of hot cider, and get lost for a while. I used bolding instead of italics, and meant “And she is one of the few…”. I’m more discombobulated by this than I thought I was. When Samuel R Delany departs, that’s all my Greats of SF gone. One of my favourite authors, second only to Terry Pratchett. :-( Really torn up. One of my favorite authors and a very cool human being. Very sad news. I loved the Left Hand of Darkness’, the Wizard of Earthsea series, The Dispossessed and more of her works. Another of the SF greats has gone but her works and her words remain and will continue to inspire thought, pleasure and people for a very long time to come indeed. , “Introduction” from Ursula K. Le Guin: The Hainish Novels & Stories, Volume One, retrieved 9/8/2017. Oh, I thought this interesting to those who did not know of it: The Left Hand of Darkness was actually turned down at first. She very kindly did not publish his name in the rejection letter he sent her: http://www.ursulakleguin.com/Reject.html Fortunately for the rest of the world who DID enjoy the book, she persevered. From forgetting Dostoyevsky and reading road signs backwards, naturally. Where else? Liked Le Guin. My mother made me read Left Hand of Darkness when she thought I was a self-hating gay. I’m still not sure it would’ve applied even if I was gay. Certainly a loss to SF&F. Many years ago, she came to a local bookstore, and talked about and did a reading of her translation of the Tao Te Ching. I recall that she was very soft-spoken, so it was hard to hear her voice. She was accompanied by someone who played a singing bowl as she read. There is an audiobook of her reading it, with accompanying music. It’s OK but it’s not great – the accompanying music is a bit too loud in the mix, and distracts. I wanted to be able to listen to it while I pretend to be trying to sleep, but I just get annoyed by the sounds. She seemed to have the soft-spoken person’s trick of making you listen by making you have to listen to hear what they are saying. Or maybe it was just how she was. At her age, death can’t really be unexpected. But my world feels a little smaller, now. When Samuel R Delany departs, that’s all my Greats of SF gone. Nooooooooo! I won’t allow Delaney to go. Or Harlan Ellison. Harlan’s getting on in years but he’s still feisty, and still short. Wondermark cartoons hang in my water closet. Ellison is also still ill-tempered as I understand it. When the grim reaper comes for him, Ellison’s gonna give him an earful. I picked up Le Guin’s translation of the Tao Te Ching per the advice of Marcus and Caine, and it was one of the best purchases I have made. Whenever work or life stresses me out, I flip to a random page and work to put it all into perspective. I read some of Le Guin’s works in high school, maybe it’s time to re-read them in memoriam. Thank you for the simple, yet elaborate, post. I just posted this here.